mysticonnie's blog: Vivre les pharmacies! Upon my return from Paris, everyone (my family, my friends, my coworkers, even my boss) asked me, "So, did you buy any clothes/shoes/accessories?" As big of a fashion junkie as I am, I had to answer, "Not much." Yes, the shopping is fabulous, and I *had* to visit Colette and Louis Vuitton on the Champs Elysee and Yves Saint Laurent on the Left Bank (Rive Gauche). I even visited the Foundation Yves Saint Laurent/Pierre Berge museum. But really, clothes in Paris are very expensive. Clothes go on sale in France only twice a year, during the soldes in January and July. Chain stores like Zadig and Voltaire which are about the equivalent of Club Monaco or J. Crew, are twice their price. Yes, Zara and H&M are great chains, but they had just arrived in San Francisco, so I wasn't so keen on checking them out. I only wish I'd checked out Kookai and Mango. I did stock up on Petit Bateau, plus I picked up some truly adorable baby clothes for some friends. Who could resist a tiny red tweed peacoat with a matching beret, jumper and knee socks? 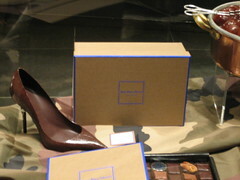 There is a bit of markdown on European luxury labels, but I was saving my money for Pierre Gagnaire. But besides food (I brought a lot of foodstuffs back), what else did I spend my money on? The pharmacies. Oh, the pharmacies. You all are probably reading this and thinking WTF??? Why is she so excited about over-the-counter drugs? Well, it only started off that way. The French make these great effervescent soluble analgesic tablets that are also loaded with vitamin C called aspirine UPSA. If I feel a cold coming on (or more likely, a hangover when I wake up) I take one of these and the world doesn't hurt as much. I swear, they lace these with cocaine or something. They also make an effervescent Vitamin C tablet that tastes better than Emergen-C. Whenever anyone asks me what they can bring me back from Europe, I always ask for this stuff (and cheese). As a result, one of the first establishments I walked into in Paris was a pharmacie (the very first was a fromagerie). Little did I know what lay in store. There were all kinds of French beauty lines. Phytologie, Rene Futurer, Caudalie, L'Occitane, Nuxe, T. Leclerc, Decloer, Leoner Greyl, Klorane... the list goes on (Kerastase is still only carried by licensed hair salons). Best of all, many of them were significantly marked down from prices in the States. The more obscure the brand, the less it cost. The pharmacie closest to Justin's house had a weekly specials, and that week, it happened to be selling Caudalie shower gels 2 for 7 Euros, and lip balms were 2 for 3 Euros. If you spent 20 Euros on Caudalie products, you got a free full sized bar of soap. Sephora here in San Francisco sells the shower gel for $20.00 the lip balm for $12.00 and the soap for $15.00. Since the pharmacies weren't exactly chain stores, prices would vary from store to store by a few Euros, even if they were right next to each other. So I drove Justin crazy by dragging him into every single pharmacie we came across. "I want to see if I can find Nuxe lipbalm for less than 5 euros!!!" (it's 21 bucks here) In St. Germain, on the Champs Elysee, in the Marais, on the Rue Faubourg, in Bastille... I insisted on checking every pharmacie, because I was sure they all offered some kind of weekly special. When I was pressed on what I *did* spend my money on, I admitted (weakly) "Besides food? Ummm, skin care and shampoo. And uh, lip balm and shower gel." I only wish I'd known about Mexoryl before I went. Time to cancel all the credit cards.